Small business owners are required to pay taxes to federal and state organizations. Often these taxes are processed manually, squandering time that could otherwise be spent running the business. 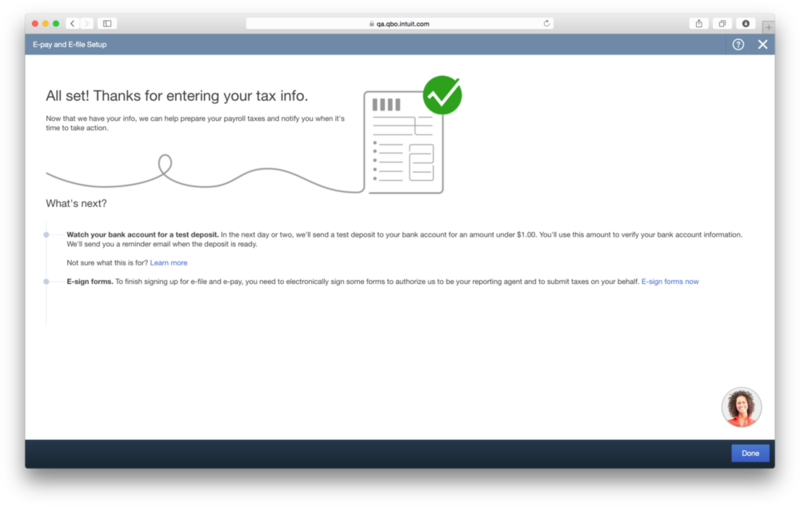 QuickBooks Online Payroll offered an electronic file (e-file) and pay service that made it a breeze for small businesses to file their federal and state taxes. However, the feature itself was extremely difficult to locate, enroll in, and start running. Because of these issues, small businesses were not leveraging the e-file and pay service. If we designed a simple in-context experience, 50% more small business owners would enroll in Intuit's e-file and pay service. Make the e-file and pay service easily discoverable to increase awareness and interest. Eliminate tax complexities and create a tailored experience for each business. Create a seamless experience that every small business can accomplish in less than three minutes. The e-file and pay service was difficult to locate in Quickbooks. The need for businesses to print, sign, and fax paperwork to Intuit created lots of churn. The lack of time and incentive to enroll in something new and unknown. I identified requirements, went broad with design concepts (lo-fi to hi-fi), drafted a research plan, then pressure tested the concepts via usability studies with our users. These usability sessions were vital. They enabled me to understand where the hiccups in the designs existed, get a clearer picture of our users' mental models, and pinpoint which concept was most viable to move forward with more detailed iterations. Initial concepts and final designs were shared broadly at design reviews with the Small Business Design Team at Intuit. Throughout the process, I worked closely with my engineering team to understand the intricacies of our code base and identify special tax regulations per jurisdiction. Each new learning enabled me to continuously improve and refine the direction of our final deliverable. For a SUPER comprehensive view into my thought process at each stage of the design, visit this PDF. The flowchart below is one of many that details every possibility a small business might encounter while enrolling in e-file and pay. The new experience reduced the number of steps to sign-up, made the tax complexities of federal and state agencies invisible, and decreased the amount of time care agents spent supporting the process. There were many different paths a small business could take to enroll into the e-file and pay service. The video on the right walks through a brand new payroll employer setting up their business with Quickbooks Online Payroll and continuing seamless into enrollment of e-file and pay. Made the service more easily discoverable by presenting the option in a relevant context (e.g. after a payroll run or before paying for taxes). Made sign-up easier by reducing the number of steps to enroll (e.g. from 9 pages to 3) and customizing each businesses' experience by presenting tax regulations they care about. Made enrollment more instantaneous by launching electronic signature via an identity verification mechanism (similiar to one you'd take when verifying your identity for a credit check). The new design kept payroll tasks front and center on the employee stage, and notified small businesses when there's an update or new tasks to pay attention to.